I recently installed Windows 8 developer previous version in my PC and now I want to revert back to my Windows 7 OS, How to do it? Can you tell me the steps to follow to uninstall Windows 8 from my PC? Re: How to uninstall Windows 8 developer preview version from my PC? same like the installation of windows 7.
according to what you are using to install. 4. From next all the steps will be same for both DVD or USB. 6. After it hit next after completion of every steps.
' select a drive where you want to install it. and determine whether the Windows.OLD folder exists. press any key to start the installation process. 4) In the Install Windows box, select your settings for language, time, etc., and then click Next. 5). In the Install Windows box, select your settings for language, time, etc., and then click Next. just press window+R to open Run , then type msconfig and press ok a another window is open in which you click on boot then u see the names of operationg system which is install on your system , then u select window8 and press delete button , and press ok . by follow these steps u can remove windows8 from your system. Case 1: You have both Windows 7 and Windows 8 developer preview version (Dual boot system). Case 2: You removed Windows 7 and installed windows 8 developer preview version on your PC. 1. Start your PC, and boot it into Windows 7 operating system. 2. Go to Disk Management, delete the partition on which the Windows 8 Developer Preview version is installed. Now, that partition will become an unallocated space. 3. Now, you can either create a new partition to use with the unallocated space, or extend the Windows 7 C: drive with the unallocated space. 4. Now restart your PC. 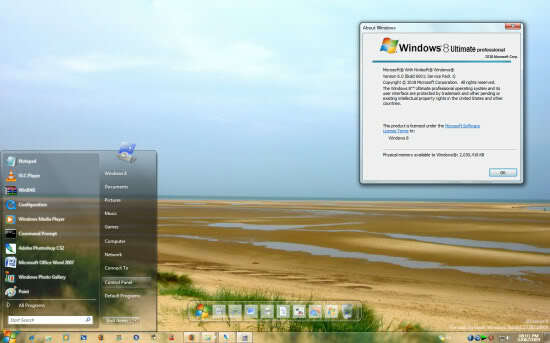 You will found only Windows 7 installed and listed on the screen. In the Case 2, if you have removed Windows 7 and installed the Windows 8 developer preview version and now you want to go back to Windows 7, you will need to reinstall it form the recovery or installation media (Like DVD media) that came with your PC. Please note that You must keep the back up of your important data before you do this. First, while in Windows 8 Developer Preview, go to Computer, in the Hard Disk Drives area, double-click Local Disk C:, and determine whether the Windows.OLD folder exists. Right-click the Windows.OLD folder, and click Properties to determine whether the Windows.OLDfolder is smaller that the free space available in the Local Disk C:. Next, insert the Windows 7 DVD or USB bootable drive in your computer, restart and when you are asked, press any key to start the installation process. In the Install Windows box, select your settings for language, time, etc., and then click Next. In the next step click Repair your computer in the bottom-left corner of the window. Now, in the System Recovery Options window, click Windows 8 Developer Preview operating system, and then click Next. n the System Recovery Options window, click Command Prompt – The command prompt is the tool you are going to use to restore Windows 7. Now that you are back to Windows 7 you can just be done, but if you want to tweak the system a little bit more, you can remove the Windows Developer Preview entry from the boot menu. To do this, go to Start , type and open the Run command, type msconfig, navigate to the Boot tab, select Windows Developer Preview (recovered) (C:\Windows.8), click Delete, Apply and then OK. Type the following command and press Enter:Last type Exit to close the command prompt and click Restart. Don’t forget to remove the Windows 7 DVD or USB bootable drive from your computer. And now you are done, you just uninstall Windows 8 Developer Preview and restore Windows 7.
as simple as go to control panel.. It is always better not to use beta version of any software or os. Nevertheless you still want to use any beta version os, you should use Dual-Boot Setup. If you have Dual Boot setup you could easily remove one os by formatting that drive where your windows 8 is. If you overwrite win 7 with win 8 , it will impossible to get back in windows 7. So solution is format you hard drive and reinstall windows 7. There is a software named Easy BCD2.1, through which you can easily go back to any of the window's version while installing win 8. You need not to worry about uninstalling. Just follow the steps given below. If you have installed windows 8 version over your previous version windows 7 hard disk partition, then re installing windows 7 , is very much easier. 3. Now you can use new partition to use with the unallocated space, or extend the Windows 7 C: drive into the unallocated space to add it back to the C.
1. Type msconfig in start search and hit Enter. 2. System Configuration box will open up. Navigate to the Boot Tab and select Windows Developer Preview. Next click on Delete. 3. Click on Apply button and then finally click on OK.
4. Now, you just have to format the partition where you had installed Windows 8 Developer Preview and then you can get your disk space back. To do so, Open Computer folder and right-click the drive on which it has been installed. Select Format. 1. EasyBCD is a free utility which can be used to uninstall Windows 8 Developer Preview. For this, you first need to download and install EasyBCD application on Windows 7. 3. Now, click on the Edit Boot Menu button. You will see the entry named Windows Developer Preview. Select it and click on the Delete button. 4. A confirmation prompt will pop up. Click on Yes. 5. Now, you have just removed the Windows 8 Developer Preview entry from your boot menu. Click on Save settings and close the application. 6. The last step is to format the partition where you had installed Windows 8 Developer Preview to get your disk space back. uninstallina an os cant be done.the only way is to delete the os and install another os. but if you are using dual booting,then you can log in from the other os and format the memory partition in which you have installed the developer preview.. Going back to your previous window form window 8 is as simple as installing your previous version of widow. The steps depend on the type of window you have previously use so post to me the previous window you have used before then I will help you out. It would be very easy to remove your Windows 8 & install Windows 7 back again. I assume that you must be knowing how to install new windows in your PC as previously you have installed window 8.
so system will first format that drive first & then it will install window 7. It would be very easier , you will be guided by the Wizard in whole process. You can remove it just insert your windows 7 dvd and run setup. itself as the installation of 7 of windows. according to which is using toes to install. 4. Of after all steps will be same for both DVD or USB. 6. After that hits next after the ending of each steps.
' choose a guide where wanting to install it. If you want to uninstall the windows 8 developer preview then you can do it by installing the windows 7 os by formatting the previously os installed disk and also it can be done by choosing a folder drive to install in the computer and also the files are to be deleted from the drive so that the preview version is made uninstalled from your computer and as well as from the hard disk drives. Click My computer --> Right Click, choose Manage --> Disk Management. There you will be taken to the page where all the partitions are listed out, simply choose the Windows 8 installed partition and format it/ Delete it. After deleting it, this space will be available a free space and you can add that to any other partition for usage. to uninstall windows 8 developer version just go to start menu and the go to control panel and then got to uninstall programs and then window will uninstall it. To Do Just Right Click the System Folder & Hit Format. Friend, you can Uninstall Windows 8 Developer Preview by following these Steps. STEP 1: Click Start > Right - Click on "Computer" or "My Computer". STEP 2: Click on "Properties". STEP 3: Click on "Disk Management". STEP 4: Delete the Partition for Windows 8. If you want to uninstall windows 8, there are two ways to do it. One is through software and one is manually. But before sending this thing I'm just assuming that you have dual boot windows. Well that was very simple task to do! Follow these steps to remove your present os and install a new one, 1:First of all, insert a windows os setup dvd into dvd drive 2:And then, double click on setup file in the dvd 3:After that,you installation will begun 4:Then do installation normally as you do with windows 7 operating system! 5:After completing the installation, you will find window.old in the local disk c 6:Select that windows.old folder and then click on, shift + delete to remove entire folder from the system 7:After deleting the windows.old folder your windows 8 os will be removed from your system! That's it over! For uninstalling Windows 8 preview follow my steps..
System on in Another Operating System. Now Right click on windows 8 installed drive, select delete option. After deletion you can do as a separate partition..
>> You cannot upgrade your Windows 8 to Windows 7 by keeping your personal files and settings. >> You will have to install a fresh installation of Windows 7. >> Your personal files and Settings in C: Drive will be deleted. >> So, if you have Windows 7 Installation Disk, you can easily format your C: Drive and install Windows 7 by removing Windows 8. >> You can upgrade your Windows 7 to Windows 8 but not vice versa. Windows 8 Beta versions can not be uninstalled. You need to format the drive to remove it. So if you have previous version of Windows keep it handy and format the drive then install Windows again. >> And Installed The Another OS Than Windows 8 Developer Version Removed From Your System. >> Than Installed The Needed Software And Driver Than Access The System.